A son’s mission to find his father, a mother’s love, brothers and girlfriends and a dancer inspired by a music legend bring lots of laughter and tears that Bollywood fans have come to know and love. Four varied and highly-anticipated movies are releasing on the big screen at select Ster-Kinekor cinemas this month, promising something for everyone. First to launch on 7 July is Mom, a tale of how far a mother will go for the sake of her daughters. 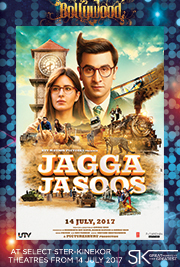 This is followed by Jagga Jasoos, which launches on 14 July, a story about teenager’s journey to find his missing father. Next up is Munna Michael, which launches on 21 July and tells the story of a young man, who tries to follow the footsteps of his idol, The King of Pop, Michael Jackson. Last is Mubarakan, which launches 28 July. It tells a story about twin brothers who find themselves in pre-marriage mess! Devki (played by Bollywood starlet, Sridevi) is a lawyer, loving wife, and a mother of two beautiful daughters. She seems to have it all, a successful career and a perfect family — but her stepdaughter Arya (Sajal Aly) cannot accept Devki and her love completely. A hopeful Devki waits patiently for Arya’s love and acceptance as she believes only a mother can truly understand the silence of her child. But, an unfortunate incident further distances Arya and Devki and she must make a choice, not between what is wrong or right, but between what is wrong and very wrong. 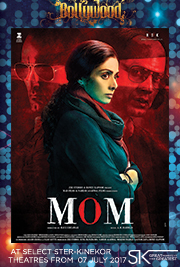 Mom is Sridevi's 300th film and is being released in the 50th year of her film career. This thriller also stars Abhimanyu Singh, Akshaye Khanna and Pitobash. The film was written by Girish Kohli and directed by Ravi Udyawar. Oscar-winning music composer AR Rahman did the music. Mom screens at Ster-Kinekor Musgrave in Durban; The Zone in Rosebank and Forest Hill in Centurion. Jagga (Ranbir Kapoor) is a gifted, teenage detective on a mission to find his missing father. While he has childish quirks, he is a genius at solving crimes. Together with a female companion, Shruti (Katrina Kaif), the film tells the story of his life-changing adventure. This funny and heart-felt film is narrated by Bollywood veteran Sanjay Dutt, and features a cameo appearance by Bollywood heavyweight, Govinda. This film is comedic and will leave you in stiches and you will shed a tear when you see the tender moments. The film stars Munna Michael (Tiger Shroff) and Dolly (Nidhhi Agerwal). Munna, a street con from Mumbai, has idolized King of Pop, the late Michael Jackson, since he was a young boy. His motto is, “Dance like there’s no tomorrow and as though no one is watching” and he does just that. He is tasked with training a ruthless gangsterMahindar Fauji (Nawazuddin Siddiqui) to become a world-class dancer in 30 days, and so the rollercoaster starts. Munna enters a dance competition and meets, Dolly, a dancing starlet from Meerut, who wants to win the dance competition. The dance competition judges are played by Chitrangda Singh and Ameesha Patel. Things get messy when Munna falls in love and is betrayed. This film is a perfect mix of love, dreams and classic Michael Jackson moves, you may even learn the Moonwalk. There are action-packed scenes and tender moments too. The film is written by Vimi Data and directed by Sabir Khan. 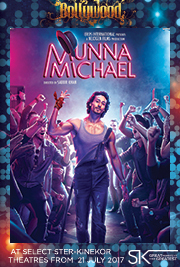 Munna Michael screens at Ster-Kinekor cinemas at The Zone in Rosebank; Forest Hill in Pretoria and Gateway in Durban. Mubarakan is a combination of comedy, family drama and romance. The film tells the story of identical twin brothers, Karan and Charan (Karan Kapoor plays a dual-role). While they look the same, their personalities are the complete opposite. Karan has grown up in London while Charan was raised in Punjab. Karan is street-smart and flamboyant while Charan is simple, and honest. The fun starts when their family starts searching for a bride for them, unknown to the fact that they already have girlfriends. Karan is in love with Sweety (Ileana D'Cruz) while Charan is in a relationship with Nafisa (Neha Sharma). Karan’s family arranges Karan’s wedding with Binkle, the daughter of one of the wealthiest families in London — but he convinces his family to make Binkle Charan’s bride instead. Charan is unhappy because he wants to marry Nafisa. Will their genius uncle, Kartar Singh (Anil Kapoor) be able to get them out of this mess or create more confusion? The film is directed by Anees Bazmee and written by Rupinder Chahal, Rajesh Chawla and Balwinder Singh Janjua with music from Sonu Nigam. The Mubarakan screens 28 July at Ster-Kinekor cinemas at Gateway in Durban, The Zone in Rosebank, Forest Hill in Centurion and Blue Route in Cape Town. For more information on Mom, Jagga Jasoos, Munna Michael and Mubarakan, releasing at Ster-Kinekor cinemas during the month of July, and to book tickets, visit www.sterkinekor.com or download the SK App on your smartphone. You can also book at the box office. For news and updates, go to Facebook: Ster-Kinekor Theatres | follow Ster-Kinekor on Twitter: @sterkinekor. For all queries, call Ticketline on 0861-Movies (668 437).